I have already discussed briefly in my earlier article on Vedic Society and Culture, some of the basic principles and values of Vedic religion. In this article, we will examine in greater detail the evolution of Vedic religion in the light of Sri Aurobindo’s insights. Vedic religion and spirituality determined for ever the character of Indian Civilisation. In all ancient civilization Religion dominated the life of people. But in India, as a result of the spiritual dynamism imparted to her mind and soul by Vedic seers, the religious quest attained such an unparalleled spiritual depth, pervasiveness, richness and creativity that it shaped and determined the inner temperament and genius of the civilization. There never was a period in the long history of India when there was not a few or many spiritual personalities upholding the banner of the spirit. There was always in every stage of evolution of Indian Civilisation, a considerable number of saints, yogis, and seeker, either spreading the light of the spirit openly as the spiritual leaders of the age like Buddha, Shankara or Chaitanya, or silently offering the flame of sacrifice to the Spirit in Ashrams and Monasteries or sometimes in the midst of ordinary life living the life of a householder. The source of this spiritual vitality of India lies in the profound inner work done by the Vedic sages whose spiritual realisations have established in the geographical and mental environment of the Indian subcontinent a powerful spiritual atmosphere which is perceived by many inwardly sensitive people. This seed of Vedic Spirituality and its atmosphere acts visibly as well as invisibly on the collective consciousness of India, sprouting up in new forms of religion, philosophy and yoga, silently entering into receptive minds and assimilating all that enters into it from outside with its own spiritual essence. The Vedic religion and society was shaped by three human types: first is the Mystic, seer and sage with deep spiritual experience; second is the Occultist, whom we may call as the Magi, with an insight and ability to come into contact with the invisible and supraphysical forces behind the visible, outer appearances; third is the Priest, the ritualist, who performed the outer Vedic sacrifice. In the Vedic age, most of the Vedic mystics had occult knowledge and power. And people who had some occult powers became priests or developed occult powers while performing priestly work. In order to comprehend the deeper truth of Vedic religion, we have to understand the inner psychological and evolutionary condition of the Vedic age. As we have already mentioned in one of our earlier article, Vedic age belongs to the infrarational phase of human cycle in which the reflective and analytical mind is not yet well developed. As a result the instinctive and intuitive faculties are more active in front. Even the masses had an instinctive sense of the invisible, supraphysical or supernatural forces behind the outer visible and natural world. In some of them or perhaps a considerable number of them, this instinct for the occult is much more well developed than in the majority. They are the ancients’ occultists for whom the Invisible is not merely a vague instinctive sense, but a more concrete reality, which they are able to see, feel or enter into living contact with them. These are the priests, magi and shamons of ancient religion. A large part of the ancient religion was created by such occult or psychic minds who had a clairvoyant perception of invisible realities. Much of this occult element in ancient religion may belong to the lower realms of the vital world inhibited by small vital beings and entities which can be invoked for satisfying the equally small needs and desires of the vital being in man. However in some ancient civilizations and cultures like Egypt and India, like for example Tantras, occultism raises beyond these lower levels into the higher and deeper realms of the subliminal Mind and Life and sometimes culminating in a profound spiritual philosophy and discipline. The aim of this higher occultism is not the satisfaction of desires, but to understand and master the laws and processes and energies of the supraphysical and invisible realms of Universal Mind and Life and harness them for inner development or for outer effectiveness in life and action. But occultism is not the highest source of ancient religion. The other and higher source is mysticism. The Mystic is someone who has a more spiritually developed inner being with an intuition or an inner sense or vision of ultimate and universal spiritual truths of life or the divine source of our own being and the universe. The mystic may reject occultism as a dangerous and harmful seeking for power and enter into an exclusive ecstatic communion with the spiritual reality. Or else he or she may include the occult in his inner discipline and aim at a more inclusive, integral and effective spiritual realization. Similarly, the occultist may ignore the spiritual and remain satisfied with his higher or lower magic or siddhis or else he may probe deeper and further and enter into the spiritual and attain spiritual realization. The mystic and occultist are the leaders and creators of ancient religion. The masses followed the religious values, and ideals, traditions and practices set by the mystic and the magi. Thus the early Vedic Rishi had an integral, comprehensive and a compassionate understanding of the way of the world and the deeper truth and laws of life. He perceived with an intuitive vision the inner and the outer evolutionary condition of the age and the people. He did not reject the needs and desires of the ordinary masses with a spiritual contempt. He knew that the majority of people lived in their rather primitive physical consciousness and they have to grow by their needs and desire. So they are provided with a religion which can help them to take the next step in their religious, moral and spiritual development without suppressing the legitimate needs and desires of their physical, sensational and emotional being in which they mostly lived. The method adapted to achieve this purpose is two fold: first to create in the people faith in higher divine powers, making them turn to these divine powers for the fulfillment of their needs and desires and the allevation of their problem and difficulties; second insisting on proper moral conduct as the condition for receiving the grace of God. The outer form of the Vedic religion is made of two basic features: First is the ritual of sacrifice in which the oblations are offered in the sacred five of the altar with the chanting of Vedic hymns and a priest presiding over the whole process. Second is a path of right living with rules of moral and social conduct. The Vedic ritual is a symbolic expression of a great principle of the cosmic order, Rta. When it is performed with a certain sincerity, spontaneity and devotion, it creates perhaps a certain amount of resonance between the consciousness of the individual with the cosmos. The religious and moral discipline of the Vedic religion emphasized on duty to the family and society, respect and obedience to parents, elders and teachers, hospitality to guests, and for honesty, truthfulness, charity, control over negative feeling like covetousness, prayer and worship of God. The Vedic religion with its symbolic gesture of sacrifice, musical chanting of the powerful Vedic mantras and the strong ethical discipline, might have been quite effective for the religious and moral development of the masses. The Vedic ritual, when performed by the Vedic man with a simple and innocent devotion of his uncomplicated physical consciousness, had probably a certain evocative power and helped many among the masses to open their consciousness to higher powers. The occult and the magical elements, through very much present, never acquired a leading and prominent role in Vedic and Indian religion. This is probably because, in Indian religion, from the Vedic age onwards, occultism and its aims were subordinated to the moral, religious and spiritual aims. Inward spiritual contemplation dyana, religious worship and devotion upasana or bhakthi and ethical regulation of life yama, niyama, and dharna are the main motifs of Indian religion. Seeking for the occults knowledge and powers is either condemned or subordinated to the religious and spiritual quest. The Vedic and tantric traditions did not condemn occult knowledge and power but viewed it as a part of the integral spiritual development of the individual and they have to be used with spiritual discrimination or under the guidance of the divine will. But other spiritual traditions of India condemned the pursuits of occult powers as a dangerous by path harmful to spiritual development. In the Vedic age most of those with occult or psychic powers probably became the priests of the traditional religion, practicing occultism as a part of their religious ministry, but not always in the right or noble way. There are many indications in the Vedic literature to show that Vedic priests had a certain inner power. In Atharava Veda we find the magical and occult element in the Vedic religion, much of it of a low kind, coming to the front with a certain prominence. And the priest, in the Atharva Veda emerges as a powerful man with magical powers. The third aspect of Vedic religion, the spiritual and the esoteric, has already been covered, though not fully, in our previous article. In the early Vedic period this higher dimension of Vedic religion was perhaps practiced only by a small group of “creative minority”, a term coined by historian Arnold Toynbee, made of Vedic Rishis and his initiate disciple in the sylvan surroundings of an Ashram. Here, in an atmosphere charged with the spiritual ambience of the Master and the beauty of Nature the Vedic rishis revealed the deeper and inner secret of the Veda to the fit initiate. We have discussed briefly the evolution of the early Vedic religion with an emphasis on the inner psychological dimension rather than its outer forms. Later developments in the Vedic religion bring the ritualistic element into increasing prominence. The simple and homely five ritual of the early Vedic rite develops into a complex science of ritual with many types of officiating priest each specialising in a specific aspect of the ritual. However from an evolutionary perspective the most important aspect of this later development is the emergence of the Atharvaveda. “My own conviction is that the Atharva Veda contains Sukthas pregnant with a spiritual meaning and containing the highest teachings on Yoga and Vedanta whose proportion is similar to the pieces in the Rig Veda. European scholars, obsessed by the idea that the old Aryan religion was at the best, a higher form of animism and nature worship, are apt to class all such spiritual and philosophical discourses as later accretions, I do not accept their premises. That it was not previously recognized as a Veda, even if the Mantra it contains did form one definite collection – a very doubtful proposition indeed – is tolerably certain. It is equally certain that it gradually won its way to its present status through its intrinsic merit, the profundity of the thought it embodied, the catholicity of its general approach the lofty tone of its moral injunctions and the message of help and hope which it brings to the ordinary man and woman who has one eye fixed on heaven but cannot take the other away from the immediate calls of this world. This is a valid and alternative view on the Atharva Veda, which is worth pursuing farther by Vedic scholars. The spiritual depth and religious intensity of the Rig Veda is perhaps missing in the Atharvan. But there is no longer the monotonous drone of the motifs of ritualistic religion we find in the other two samhithas and in the Brahmans. There is a more diverse and manysided pursuit in every aspect of religion, the occult, magical, mystical, philosophical, popular and the traditional. The interest and curiosity of the Atharvan is not confined to religion; it embraces also the secular and earthly pursuits like medicine, science, and statecraft. The other positive feature of the Atharva Veda is that it already contains some of the profound methaphical and spiritual ideas of the Upanishads and also other occult-mystical ideas which are further developed and synthesized in the later Tantras. The source of his new stream of thought and practice which emerges in the AtharvaVeda could be either innovations within the Atharvan culture or it could be the remnants of the occult and mystical traditions and practices of the earlier stage which somehow are not included in the other samhithas. The significance of the AtharvaVeda lies in the fact that it represents a stage of transition in the religious and cultural evolution of India from early Vedism to a new synthesis. When we examine the evolutionary process of Nature with a discerning eye we will see that every cycle of progress has three stages. First is the stage of concentration and creation in which the guiding values, motifs and ideal of the cycle or the age or the civilisation are created through a concentration of the creative energy in a few centers. The second is the stage of consolidation and diffusion of the values through tradition and institution, culture education and mass-communication. The third stage is the stage of transition to a new cycle or stage of evolution. We can perceive these stages in every major cycle of evolution and also in each sub cycles. In the Vedic age, the early Rig Vedic period represent the first stage of creation. The later Vedic period of the Yajur-Sama Veda and the Brahmans represent the stage of consolidation and diffusion of the exoteric religion but not yet the deeper spiritual values of the Vedas. This diffusion of the higher values of the Vedas happened later in the epical and puranic age. The Atharva Veda represents the third stage of transition. Many things happen during the transition. There is a gradual weakening of the hold of past traditions on people, not the essence or whole of it, but those values, ideals or forms which no longer serves the evolutionary purpose of Nature. As a result the rebel and the innovator, genuine and the pseudo, asserts his freedom and independence from traditional forms of thinking. The genuine and the creative among them receive the new thought of the future and express it without any fear or hesitation. In the Atharva Veda, we find religious thinkers asserting boldly that the followers of the triple Vedas will reach the highest heavens whereas the Atharvan go beyond to the great world of Brahman. And this is one of the main ideas of later Vedantic thought. Similarly in the transitional stage all the “heretic” ideas, tendencies, cults which are either suppressed, rejected, or persecuted by the past traditions or remaining at the fringes of it come into the open, proclaim their existence, and pursue their ideas, tendencies and practices. Thus the doctrines and practices of the Vratya cult which was condemned by the traditional Vedist occupies an honorable place in the Atharva Veda. The Gods of the earlier Vedic religion and the ritualistic cult were no longer prominent in the Atharvan religion. The later religious synthesis of puranas and tantras with new Gods and forms of worship, are not yet born. So the popular religious culture lacking a better alternative has fallen back to shamanism. But the higher mind of the community was pursuing new lines of thought, experience and practices in mysticism, philosophy and science. For example, there are description of deep and profound mystical experiences of an Atharvan sage, expressed in a language which is very different from that of the earlier Vedism. And in Atharvan period, the Indian civilization as a whole is shifting from an infrainterllectual and symbolic age to a more intellectual age in which symbolic, instinctive or intuitive mentality is replaced by the more reflective and philosophical mind. So in Atharva Veda we find profound spiritual and metaphysical ideas with a much greater intellectual content than the earlier periods, and expressed in a more direct language. For example as we have mentioned earlier, the Upanishadic doctrines of the Atman, the indwelling eternal Self in man, is expressed in a more or less similar language of the Upanishad: So Atharva Veda is not the degenerate remnants of the earlier Vedas. It represents the gradual transition of the religious and cultural life of the nation towards a new synthesis of the Vedanta, tantras and puranas. M.P. Pandit, Mystic Approach to The Vedas and Upanishad, Ganesh and Company, Madras 1974, p.7. 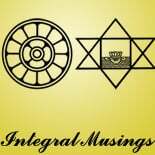 This entry was posted on June 24, 2013 by integralmusings in Indian civilisation & Culture.